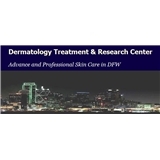 Dermatology Treatment & Research Center (Dallas) - Book Appointment Online! William Abramovits,Stephanie Saxton-Daniels, and their staff would like to welcome you to Dermatology Treatment & Research Center. Our physicians are Board Certified Dermatologists offering many years of experience mixed with the latest knowledge and today's technology. We strive to provide excellent service in medical dermatology, treatment and research. Surrounded with a first class team of personnel, Drs. Abramovits, and Saxton-Daniels want their patients to feel that we provide the best Dermatology has to offer, in a friendly and compassionate atmosphere. Just to mention a few areas of Dermatological expertise, our Dermatologists specialize in Psoriasis, Hair Loss, Alopecia, Skin Allergy Patch Testing, Eczema, Atopic Dermatitis, Skin Cancer Screening, Botox, Skin Pen Technology, Restylane. Ask about our new and upcoming Skin Type Solutions for total skin care needs. She was great! Very thorough, informative, and friendly. My visit with Dr. Abramovits was excellent! I haven’t felt so comfortable and at ease at a doctors office in a very long time. Very knowledgeable and kind! Will be coming back to him if needed.